Sign-in to your Escapist account to enter contest, post comments, and simply be more awesome. EA Los Angeles, the studio behind the reboot of the Medal of Honor franchise, has been renamed to Danger Close. "Danger Close." It sounds like the name of a developmental league professional wrestler who's about to be smashed over the head with a flimsy garbage pail in a vicious surprise attack by his dark-hearted nemesis, Cheeseball Fantastico. Seriously, "Danger Close?" Is that actually supposed to mean something, or is it just meant to sound macho? Apparently it does mean something. 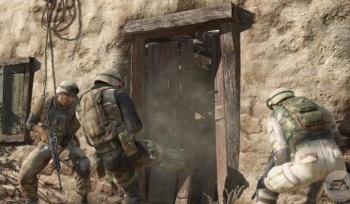 "When an individual is calling in for danger close fire, it's the decision to take a chance, rather than sit back and call in from afar," Medal of Honor Executive Producer Greg Goodrich told Gamasutra. "For our team, 'danger close' is about pushing the boundaries and taking chances on telling a story we felt needed to be told. It may be controversial, but we felt it needed to be told, and we're telling it with respect and authenticity, to shine a light on these guys." "These guys" are the soldiers who fought in Afghanistan invasion of 2001, the conflict upon which the new game will be based. Goodrich compared the studio's renaming to the decision to move the Medal of Honor series out of the Second World War and into a more modern conflict. "It's a refresh. It's an opportunity," he said. "It's a way to get our own identity." Yet at the same time, he claimed that the studio didn't really need to be "reinvigorated" because it feels like it already has been. "The deeper meaning of Danger Close is, that, yeah, we got through those times, but we've come out of it," he continued, presumably referring to the lean years in which the Medal of Honor series was rendered largely irrelevant by Activision's Call of Duty games. "We've got a great game we feel is going to do well." As for Danger Close, Goodrich said a few names had been kicked around but that the final decision was made while senior creative director Rich Farley was playing the new game. "We heard one of our characters, Jimmy Patterson - the grandson of Jimmy Patterson from the World War II era of Medal of Honor - scream out, 'Danger close! Danger close fire!'" he explained. "We said, 'I think Jimmy Patterson just told us what to name our studio.'" I still think it sounds silly. Medal of Honor is scheduled to come out on October 12 for the PC, PlayStation 3 and Xbox 360.